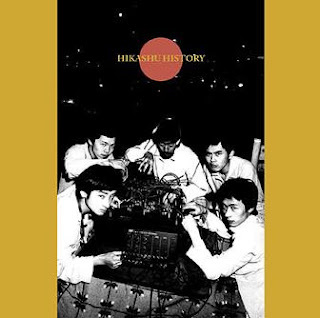 "Hikashu History" is a compilation released in 2001 on John Zorn's Tzadik label. This is recommendable for newbie fans as sampler or introductory disc for various reasons; Since being released on influential US label, it's well-distributed, and probably the easiest to find. Even it's available via iTunes and amazon mp3 download (here and here). And it does contain lots of featured numbers in the band's gig like Puyo Puyo, Pike, and Biro Biro, with different arrangement and instrumentation. 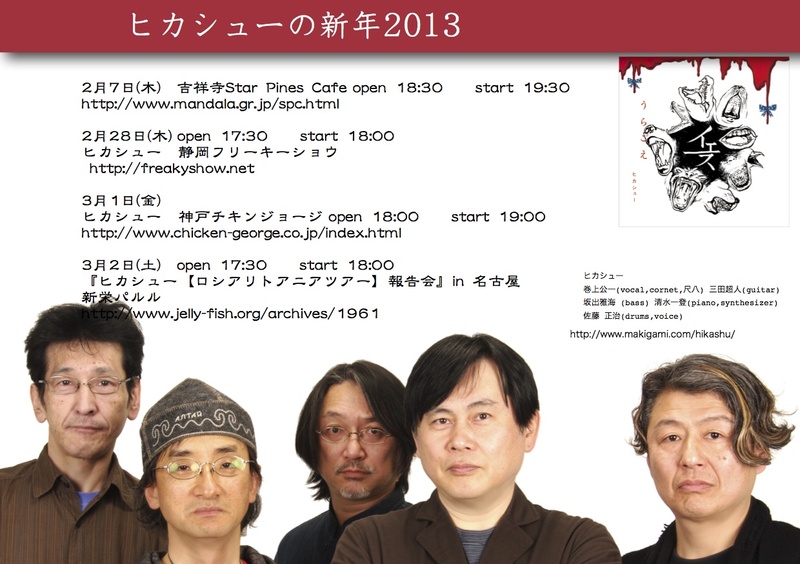 The album was compiled by Makigami himself, who owns the vast collection of the band's archival tapes. All tracks are exclusive for this album and available nowhere else. Makigami Koichi is one of Japan's most popular underground performers and Hikashu History follows the journeys of his remarkable rock/pop band Hikashu through twenty-five years of musical mayhem. From techno to noise/sampler improvisation to jazz, folk and beyond -- all with a Japanese twist, Hikashu has been anticipating styles and charting new paths in Japanese music for decades. Hikashu History documents their musical explorations through private tapes, rare demos and exciting live recordings. A fascinating view of one band's visionary directions. The following is track-to-track information of the album à la Frank Zappa's You Can't Do That On Stage Anymore series. Dates and locations are official and taken from the liner-notes of the album. On the other hand, personnel and instrumentation for each track are based on our speculation, derived from various sources. Commissioned piece for short film by French filmmaker. Those two tracks were recorded live shortly after the release of the "Ningen No Kao" [People's Faces] album. Egg Man is a venue located in Shibuya, Tokyo, and still in operation today. Solo performance by Inoue. Yaneura was a small but quite influential venue, located in Shibuya, Tokyo. Yaneura is Japanese word which means loft or attic. As well as Egg Man in Shibuya, Hikashu used to appear at the place frequently in their early days. It still exists but under different management and it's no longer what it used to be. This number was featured in the independent film "Zokubutsu Zukan" [A Guide of Bad Taste] based on Tsutsui Yasutaka's novel with the same title. Both Makigami and Mitama also appeared in the film (as a bad taste critic). There's chant-like vocal in introduction. Surrealistic at its best. "it's likely that an elephant seal has started to set up a harem in my room./My country doesn't approve of elephant seals, so told am I./I need to be more tolerant to elephant seals./Naturally I'll come to find the reason why I fear elephant seals someday./I wonder if there's someone dealing with the elephant seals in my room." Note that in interlude of "Mask," Sensui Toshiro was performing around the rhythmic pattern made by machine. Being an additional member then, he became a regular early next year. Mitama, later to be Mita Freeman, improvised at home. From one of their earliest performances in Osaka. The lyrics of the song was inspired by Paul Goodman's "Speaking and Language." Commissioned for the first TV ad of Toto Washlet (wikipedia). "After easing nature, just go washing (ahhhh), and it feels good." Written and performed for Makigami's theater troupe "Ulysses." Recorded live for the band's documentary on NHK-TV. Here you can listen the performance entirely - including the latter part which was buried under a narrative by mix for actual broadcast. Instrumental version, prepared for a film festival in Tokyo. Mitama's wailing guitar, frantic batteries from Yamashita's rhythm box, and Inoue's distinctive sampling sounds (played on his heavily-modified mellotron). Everything's utterly spectacular. Collective improvisation with a theme conducted by Makigami. This version has a lengthy, percussive, gamelan-like introduction prepared by Inoue. Makigami made this recording for dance piece called "Blue Banana Bar." In the second bridge, Makigami shortly referred famous line from the Crazy Cats, one of the most influential musician / comedian group in post-WWII Japan. Live performance of the lead track from Orguss 02 OST. The album was reissued in 2012 under the different title "Fushigi O Mitsumete," newly remastered and added the short version of the song (the one actually used in the animation) as bonus track. The album ends with this serene number, which is said to be a warning for technomania. Hikashu will perform in Shizuoka and Kobe next week. The details are as follows.